One of my images of a Red Shirt demonstration in early April, a few days prior to the first serious riots in the nine week show-down between protesters and the Thai government, ran in The Daily Telegraph’s education pages in the UK in early June. At the time, I think it was April 4th, the mood was still relaxed, boisterous and carnival-like even. It was also extremely hot. 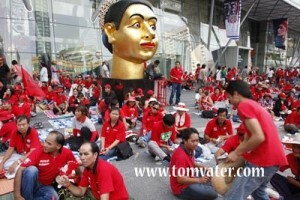 The Rajaprasong area was a sea of Red Shirts, most of them older people, bussed in from the provinces. It would have been hard at the time to imagine the apocalyptic scenes that were to follow six weeks later. The image ran with a story by ex-pat writer Stephen Leather – Navigating SATs in a war zone – an account of his daily life in Bangkok during the recent riots.